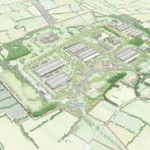 Huntspill Energy Park – site of the famous Royal Ordnance Factory at Puriton, just north of Bridgwater, is to be an integral part of the new Heart of the South West Enterprise Zone announced by the Chancellor in his Autumn Statement to Parliament today. It is great news for Bridgwater and Sedgemoor as a whole. And it comes hand-in-hand with the formal Government announcement that the new facilities at Cannington are to become a national training centre for nuclear power. This area, once again, has proved its resilience and flexibility. Bridgwater is going places!